While pretty when in bloom, Datura inoxia is considered by the USDA to be a noxious weed. Banned in many areas, Datura inoxia is deadly to many animals and is highly poisonous to people. Known by many different names, including downy thorn apple, jimson weed and moonflower, Datura inoxia once established is hard to eradicate. 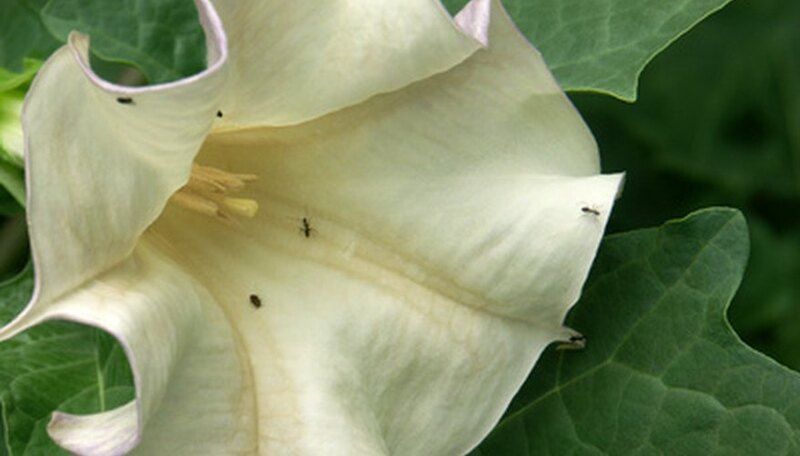 Datura inoxia grows in almost any soil type and becomes invasive quickly. Dig up Datura inoxia at the first sign of growth using a shovel or garden spade. Ensure that you dig up all of the root of the plant, as Datura inoxia will grow back from a small portion of the root. If you can destroy the plant before it flowers and seeds, you can stop the spread of the weed. Spray established plants with a broad-spectrum herbicide. This will kill the plant. Any seeds it has distributed will have to be destroyed using the shovel method as the plant emerges. Take care when spraying herbicide that you only spray the Datura inoxia and not desirable plants. Lay black plastic in areas where there is a heavy infestation of downy thorn apples. Dig up the existing plants before placing the plastic on the ground. The black plastic will prevent any further growth of the weed. Keep the black plastic over the area for at least one year to ensure that all plant growth is deterred. Dispose of dead and dug-up plants in an area where regrowth will be prevented, such as garbage cans or a trash dumpster. Datura inoxia can grow from roots or cuttings of the plant. Datura inoxia can grow as high as 5 feet tall with trumpet-shaped blooms of 6 to 8 inches. Datura inoxia has a long history of use for medicinal and religious purposes. It is believed that jimson weed got its name from the colonial settlement Jamestown. Datura inoxia is occasionally grown for its ornamental beauty in gardens. There are a number of varieties of Datura inoxia; all are toxic to humans and animals. The flowers of Datura inoxia are very attractive to children. Since all parts of the plant are poisonous, it should never be grown in gardens or other areas that children may visit. How Long Do Queen Anne's Lace Flowers Bloom?